Actor and aikido master Steven Seagal has become a Russian citizen. 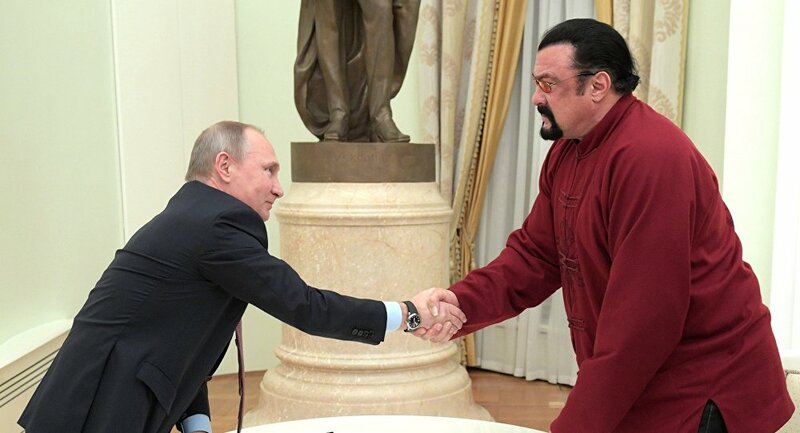 MOSCOW (Sputnik) — Russian President Vladimir Putin has personally handed a Russian passport to US actor Steven Seagal in the Kremlin on Friday. “I would like to congratulate you and express hope that, although small, this gesture could also be a sign of the gradual normalization of relations between our countries,” Putin said during a meeting with Seagal. The US actor said in turn that it was a great honor for him to be in the Kremlin at a personal meeting with the Russian president. "Spasibo bolshoe [Thank you very much]," Steven Seagal said in Russian after signing the passport. On November 3, Putin decreed to grant Seagal Russian citizenship. Seagal joined the ranks of famous US citizens who were granted Russian citizenship recently along with boxer Roy Jones and mixed-martial artist Jeff Monson. — President of Russia (@KremlinRussia_E) 25 ноября 2016 г.
What’s Eating Roy Jones Jr: When Should The Boxing Legend Hang Up Gloves?